In the hot days of summer, it is important to stay hydrated. Water can get boring when it is all you are drinking, so it is nice to have options to change things up. This peach mint iced green tea recipe has added flavor and natural sweetness from seasonal peaches and fresh mint. Green tea is full of polyphenolic compounds which act as antioxidants that lower inflammation and could help prevent cancer. Green tea can be made both hot and iced, so you can enjoy it year-round. Just brew the tea as you normally would, then chill it. Bring water to a boil. Remove from heat and steep tea bags until tea is to your desired strength, 2 to 3 minutes. Stir in honey or stevia if using. Pour into a large cup and refrigerate until cool. 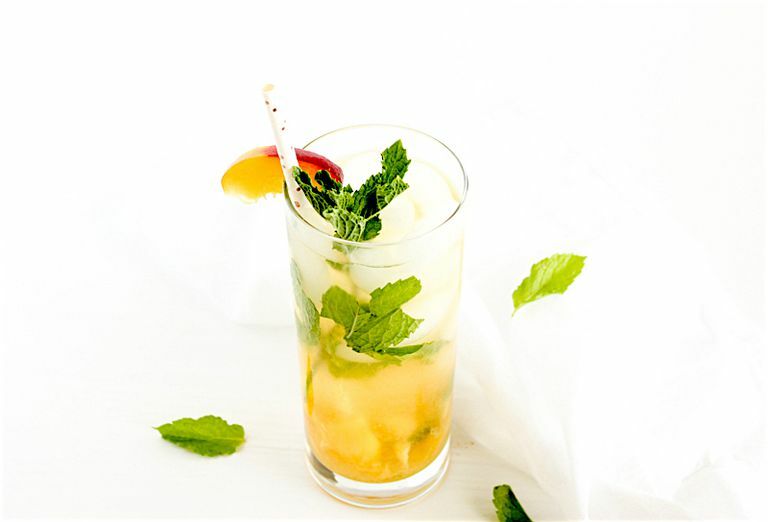 Divide peaches and mint between 2 glasses and muddle. Fill glasses with ice. Pour cooled tea over ice and stir. Enjoy. Use black, white, or herbal tea (great for stress-busting) in place of green tea to fit your needs. Each has its own unique benefits. If you prefer your tea sweeter, you can stir in a little bit of honey (or stevia to make it diabetes-friendly) after brewing but before chilling. You could even make a large pitcher to sip on all week or to share with company. Careful not to get the water too hot, or your tea may be bitter. 160F to 180F is the optimal temperature.